Here is most of a blog post from Giant Steps Press, which I found quite interesting and hope you readers will too. From 12/28/02. 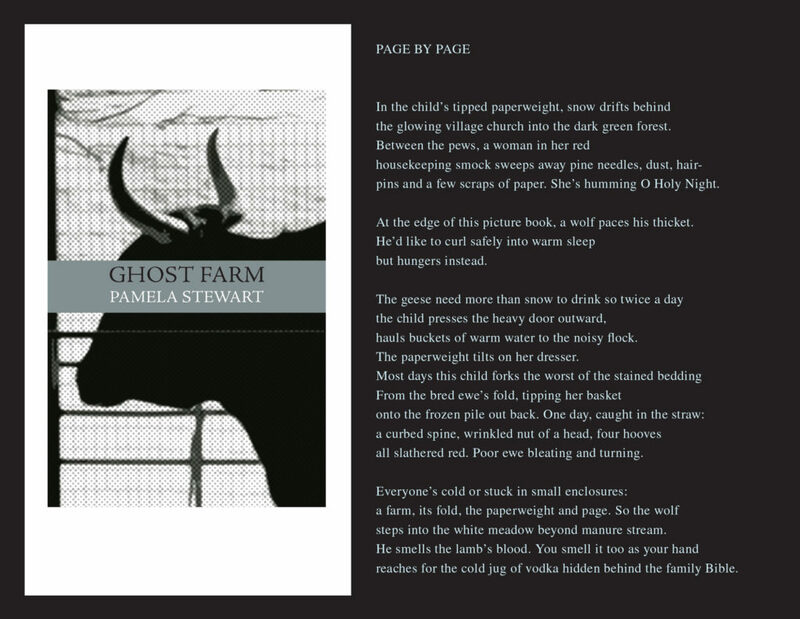 KIRPAL GORDON: First off, congratulations on the publication of your new book, Ghost Farm, by Pleasure Boat Studio. Cynthia Hogue wrote, “These poems have the crystalline elegance of folklore, yet Stewart also meticulously details the dailiness of life on a farm.” That combination of celebrating the everlasting amidst the ever-birthing-dying pours out on every page like the heart of a joyous discovery. I thought of Gautama under the Bodhi Tree and Demeter at Eleusis reunited with Persephone. PAMELA (JODY) STEWART: Oh, thank you Kirpal. I was so happy to publish this book and Pleasure Boat Studio is a press I greatly admire. Supremely eclectic! Being naïve and ignorant and then suddenly caught up in raising animals has been profound for me: joyous, painful and accountable for my mistakes in a whole new way. If that soft red tube goes into a lung, I kill the lamb. If it doesn’t, I shape a good chance for its survival. Daily. But for health reasons I can’t really work in the barn anymore (pigeons, can you believe it?) and the farm is winding down. I miss it and I sure was in better shape when I did more chores. Yet it never leaves my consciousness. And in August we had a miracle lamb which meant some Ram got out or had a long reach last March. 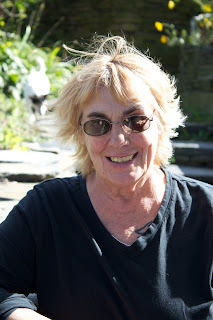 Mary– a Karakul/Shetland cross whose birth cheered up everyone. the glowing village church into the dark green forest. pins and a few scraps of paper. She’s humming O Holy Night. At the edge of this picture book, a wolf paces his thicket. hauls buckets of warm water to the noisy flock. The paperweight tilts on her dresser. all slathered red. Poor ewe bleating and turning. steps into the white meadow beyond manure stream. reaches for the cold jug of vodka hidden behind the family Bible. The details cohere cinematically while leaving plenty of room for interpretation. Even the title, “Page by Page,” had me hooked. PAMELA (JODY) STEWART: Oh titles are always a dilemma. I thought of it as an illustration, but couldn’t use that (again) as a title and in truth the poem was inspired by a full-page magazine ad for Vodka with lots of white sheep faces and a single wolf face captured in the bottle behind glass. As though being the bold and beautiful wolf made you the exception and yet how threatening is the notion of a wolf-in-a bottle for the person who needs to “un-friend” the booze. I liked the picture’s ambiguity which has nothing to do with the sort of fairy-tale quality which took over the coloration of the poem. As I’ve pondered these references to folklore I realize how much I have been influenced by fairy tales and the pictures they made in my mind. Also in many of my poems, for reasons I don’t quite get, there is an undercurrent of threat to children which may arise from these same stories as well as how my psyche is compelled to translate them. lustrous as first love. I remember how my halo-ed sweater felt, how it held against those kisses of fright and need. A big buck watches from his pen. He’s waiting for longer, colder nights as his scent drifts downwind. One tattered doe, fleece torn by fever, also waits For that shortened day which stuns. There’s a cry from a distant forest. Windfall apples call the goats to graze. Their bright hair flows. These goats are in my charge — sheltered, not quite safe. Jody, it’s the combination of the goats being “in your charge” with the lyric you make of their dilemma that makes a poem no one but you could write. I mean it’s music while also being scary and utterly real! PAMELA (JODY) STEWART: I would like to celebrate angora goats even more with words; they are lovely animals but are probably best comprehended through sight and touch. We had a funny start with goats having picked up 9 cull does from a university which was disbanding goats. They were in god-awful shape, unshorn, no feet trimmed for a year easily, poorly fed and they were all bred! The sense of their fragility, and for some a bitter struggle to stay alive through a tough winter and birthing. A lot of their kids were very frail and some died. I think that set me up for the powerful sense of responsibility husbandry requires. 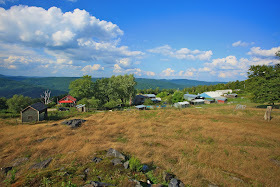 When I am with the animals, or the memory of our experiences, I feel farmer. When I muse or ponder or am stirred to even a few words I feel – well not exactly poet, but possible poet: poem-writer.It gets all mixed up which is just how it goes. KIRPAL GORDON: I think I last saw you in New York City when you gave a reading in midtown in the early Eighties. I think you were en route to Cornwall, thanks to a Guggenheim Fellowship, and I know you lived in the UK for seven years. What caused you to return to the States, to Hawley (near where you grew up) and to farming? PAMELA (JODY) STEWART: I had the glorious Guggenheim though no job and as usual felt something of a misfit. When I traveled I met Ed—it was all very romantic, though now it’s nearly 30 years and many stories later – so I went and lived in Cornwall for 7 years. That was wonderful for me, though often difficult. I thought I’d lean at a window watching the sea and write great stuff! Be somebody! Instead I learned to make scones for Ying Chang who ran a little English café while her husband ran the Chinese restaurant. Oddly, I think Ying was the first Asian woman I ever really talked to. She was important to me. Anyway, the Thatcher years had caused dismal economics and fishing wasn’t much good where Ed worked so after returning for my Grandmother’s memorial service Ed decided we should move, I wasn’t so sure as I’d finally settled in. But we did come to westernMassachusetts where my heart lives when it’s in America and eventually we found a place with quite a bit of land and lots of privacy and that’s how Tregellys Farm started. With no electricity, no phone, gravity feed water and no idea what the bugger hell we were doing except that we would get a few llamas because they were cool. Then we attended the Heath fair in 1994 and returned with two Tamworth pigs and a pair of old-style Merino wethers. And it was active addiction from then on . . . . We had no idea where this would lead and had lots of ideas none of which became money-makers, but hey- “that’s farming.” However I am solidly aware that we were in the “gentleman’s” category compared to the local dairy farmers in this area who have kept their small farms going with a kind of grit and hard work I can’t begin to fathom. I always was attracted to Hawley because great potatoes have grown here. It’s also tiny, all edge, no center. However, I’ve been an infrequent writer since life is very busy and mostly I’d just as soon sit down and read quietly with no one bothering me. Around 2001-2 we got a few yaks and through that met a number of Tibetans which is another story entirely. What can I say – it started with Ed going yak shopping and returning with two boys, Rupert and Horatio. Of course the little weekly newspaper took a photo and the next week, while having a cup of tea we looked out our window and saw a pair of monks striding past. They’d come to see yaks which they’d had not seen since they escaped to India. It was like breathing a moment of home for them. Before long we had a family live with us temporarily and another friend, a brilliant stonemason, has been living with us for about ten years now. While we are not real practicing Buddhists, we have a beautiful stupa on the farm which stands as a 9/11 memorial among other things. Here and there are prayer flags which continually get blown to pieces on windy Hog Mountain. Which is the whole idea. KIRPAL GORDON: I recall you as a great creative writing teacher, open minded about form and content as opposed to representing a theoretical stance. In the era of the alleged “po wars,” such candor was especially courageous and skillful. Do you still teach? PAMELA (JODY) STEWART: No I don’t teach. Sometimes I chat with friends about their work where I hope I am of occasional use and also ask for suggestions from them. I have no theoretical stances. I’m not sure if I even have ideas about poems or literature. I am intrigued by much but think some of it is just a great big bunch of publishing fussiness. Some of it can be interesting though. I believe in “Art” sometimes, because that impulse matters –- caring beyond the self matters. But not every worthy poem or poetic impulse is “Art”; why should it be? –that doesn’t mean our endeavors can’t have a perfectly good life of their own and earn our affection and respect. KIRPAL GORDON: What do you make of American poetry these days? 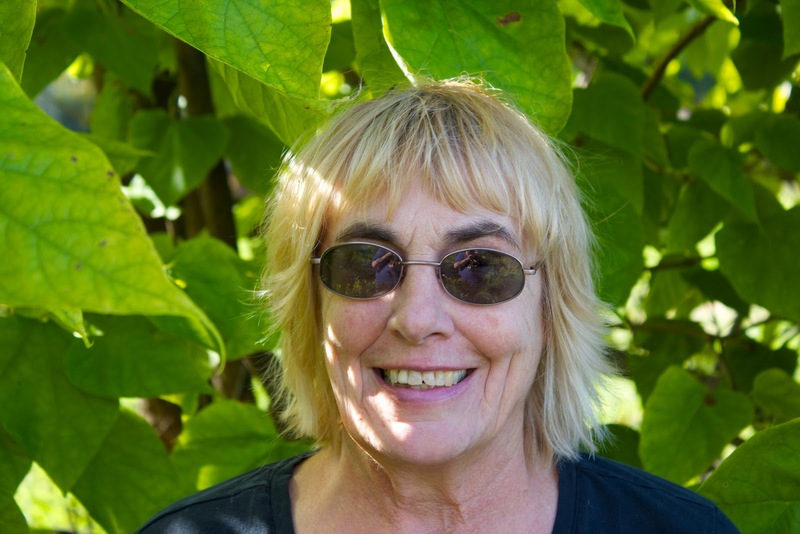 PAMELA (JODY) STEWART: American poetry?There’s a lot of it! If it were ice-cream flavors we’d be flat on our backs. It’s varied, a wilderness, so many voices that were once “marginal” are right out there– you could read forever so I think we are lucky. But it’s also overwhelming so I find it difficult to sense if one thing is more important than another –cliché or not, I usually just like what I like. Then there are those blows from above like (non American) Fawsi Karim’s The Plague Lands which reminds me why “Art” is real and noble so I am deeply, joyfully humbled. KIRPAL GORDON: Since the mid-Seventies, you have published a number of chapbooks as well as five full-length collections of poetry, the last of which was The Red Window, University of Georgia Press, in ’97. What projects are on your horizon and how can Giant Steps readers stay in better touch with all of what you do? PAMELA (JODY) STEWART: Well, I have been working sporadically on a New and Selected sort of project at the urging of a few friends. It’s really hard because it’s important to me to have poems genuinely mine and not much influenced or helped by early teachers. Also I don’t have a big batch of “new” so I may never accomplish this. I haven’t published in magazines much lately though I am willing to try again this year. Also I am the literary executor of the poet Lee McCarthy and there is a folder of really delightful letters between her and Guy Davenport which I’d like to shape and offer somewhere. I just haven’t tackled it because I haven’t any house elves to take up the slack. Also my elderly Mom lives with me, my husband’s not too well, and we have 9 dogs who require letting in and letting out continually and our resident boy, Tenzin, is still in school. But I lead a most fortunate life. Thank you for letting me ramble on! Next post: Jack Estes traveled to England and Europe to visit Chas Mayhead, (‘Rumours: A Memoir of a British POW in WWII’) for his 100th Birthday.